The Year of OpenStreetMap continues! Yesterday, Fourqsuare announced that it had changed map providers from Google Maps to OpenStreetMap (OSM). Good news, right? Yes. Fabulous news. Wonderful news. Best news of the day. Unless, apparently, you are a Foursquare user. Worst. News. Ever. How dare they change something that I use for free in order to save themselves some money? A bunch of you have asked if this affects the maps in the foursquare app on your phone. It does not. We use the mapping components that come integrated with iOS and Android. 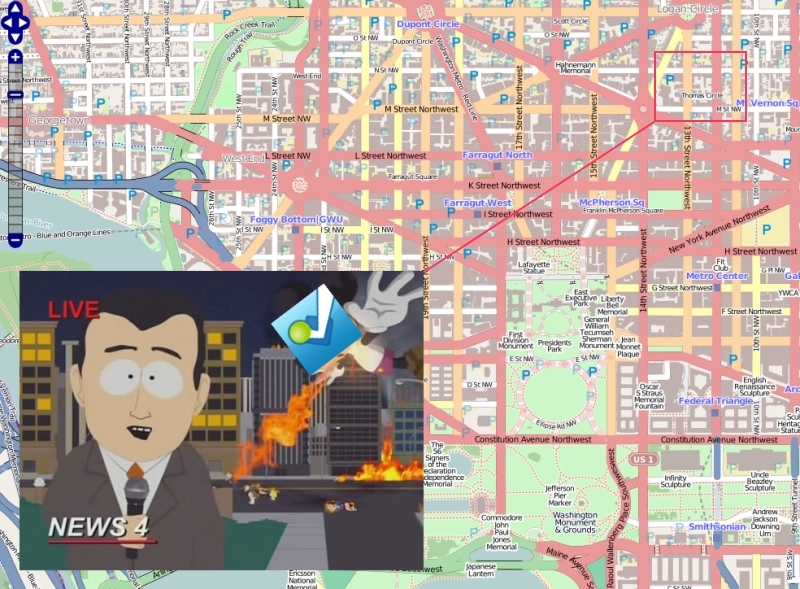 Since the iPhone SDK and Android Maps API use Google Maps in connection with their platforms, we’ll still use those maps. As a location check-in service, it’s safe to estimate that 98% of Foursquare’s traffic comes from iPhone or Android phones. Google (or, more likely, Apple) will not be pulling the Google Maps API from the iPhone any time soon; of course, Android will also be safe from such an occurrence. So mobile users’ unrequited love of Google Maps will continue to be satiated by their pocket companions as if nothing had ever happened. Keep calm and carry on. 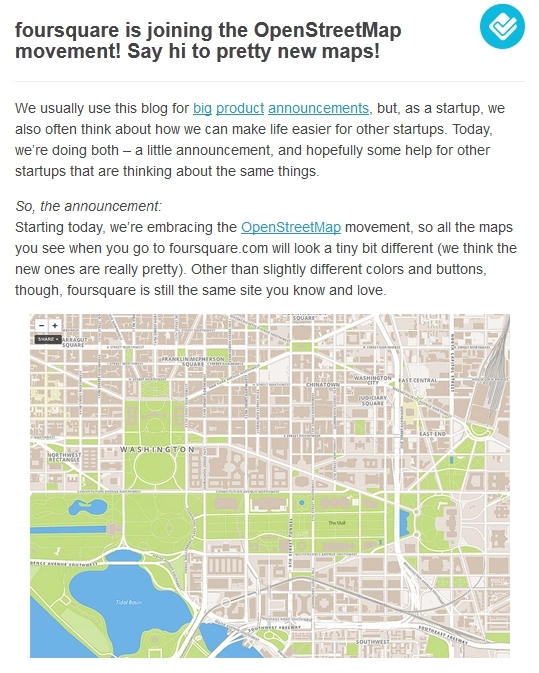 Foursquare’s announcement dovetails nicely with MapBox releasing MapBox Streets earlier this week. MapBox Streets is aimed squarely at Google Maps API users, but with a toned-down style to accentuate the host services’ data. I generally like the appearance but see room for improvement, namely a couple more zoom levels and better differentiation between street classifications. I haven’t taken a look under the hood yet, but everything I’ve seen suggests that the OSM basemap in MapBox Streets is a live view of the OSM data (or, at worst, nightly update) rather than a checked-out version. This allows for quick database expansion in areas that the Foursquare users above were griping about, if they ever quit whining and start contributing. I think Foursquare was wise to choose MapBox Streets for their basemap. Imagine the chaos that would ensue if they had used the default OSM styling. 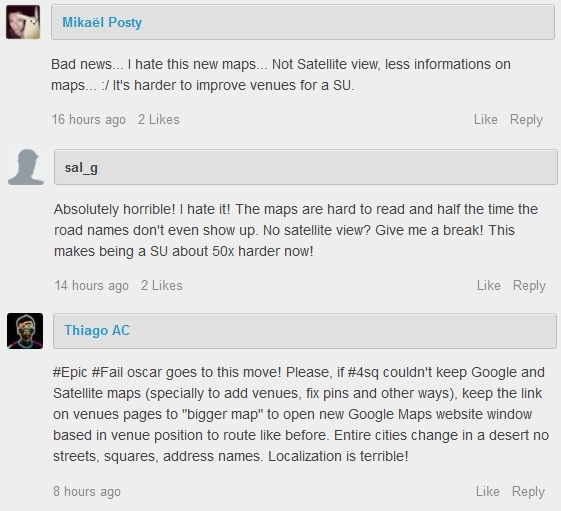 Foursquare users revolt due to OSM map styles! Film at 11! As Year of OpenStreetMap (shorthand nomination: YOOSM) rolls on, OSM will continue running into FUD from Google and GMaps fanboys. The only way to power through it is to keep adding bigger fish, which will get easier as Google Maps API charges pile up on larger mapping services. It’s only just beginning.